Traveling and exploring new places has always been a passion of mine. All through college I worked for an airline and would hop flights all over the world at a moments notice. When Nick and I met we started taking trips together. His love for travel and scuba diving exploded! Fast forward 10 years and 3 kids later we were living the "American dream". House, kids, occasional luxuries and the 2 weeks off a year for vacation. Two weeks is never enough to satisfy a love of traveling. Faced with an unexpected change one day, we had to decide to either maintain status quo or do something completely different and follow our true passion. In 3 days, we decided we were going for it! We would pack up the kids and travel the world. 6 weeks later, we had our house rented out, sold a quarter of our belongings and put the rest in storage. That was the fastest six weeks of our lives especially since we Nick had so much work to get the house rent ready. Now that we are traveling I wish we would have sold everything, except the house. The rental market is really good right now in Dallas. We are currently trying to sell our cars. We plan on visiting the US next July for one month and hopefully we will sell the rest of our stuff then. Stuff has a way of holding you back. We were never really the "typical" American consumers. We both love a bargain and a bargain at a garage sale is 10 times better then one at Target. We've never been the type to buy something we couldn't afford, well mostly. We always found the latest and greatest toys at garage sales that looked new for pennies on the dollar. Whenever we did buy toys new, our kids had more fun with the boxes than the toy. Everything we did buy was put on airline mileage credit cards but paid off the same month. We earned enough miles for round trip tickets to Asia for a family of 5. We paid off our cars, avoided creating new bills and never lived beyond our means. In 2011, we cut the cord (canceled cable TV) and signed up for Netflix. We switched from Verizon to StraightTalk (keeping the iPhone of course). These two changes alone saved over $2000 per year. We are trying to create a new "American dream". One where we travel and experience this world with our kids. We hope to raise our kids with a passion for travel and not get caught in the trap of acquiring stuff. Once we decided to create our own American dream to travel the world with our kids we had to figure out where to go. We've been to South and Central America before and loved it! Plus our kids had been in a Spanish immersion preschool for a few years. Bonus! The cost of living was fairly cheap however to get from one major country to another by plane is expensive. Bus is affordable but we are newbies at travel so a bus with 3 kids under 6 wasn't too appealing. Now it sounds fine. Southeast Asia was our next choice. I've been there. It's super cheap plus they have numerous discount airlines that allow you to fly everywhere for almost nothing. We just bought tickets from Malaysia to Bali for only tax. Less then $40 USD per ticket. Done! Southeast Asia it is. Checking out various countries everyone seems to have some sort of visa limit or cost. For example, Thailand allows you to enter for 30 day then you must get out. Indonesia allows 30 days also plus you have to pay a $25 USD visa fee on the way in and $15 USD on the way out, per person. Ouch! Malaysia on the other hand allows you to enter for 90 days at no charge! Winner! We wanted to start this journey slow since we still had no plan and not be rushed out of a country. Now, where in Malaysia? It's a big divided country after all. We want kid friendly, beaches, lots to do, cheap of course. After much searching on the topic of Malaysia I kept coming across the city of Penang. 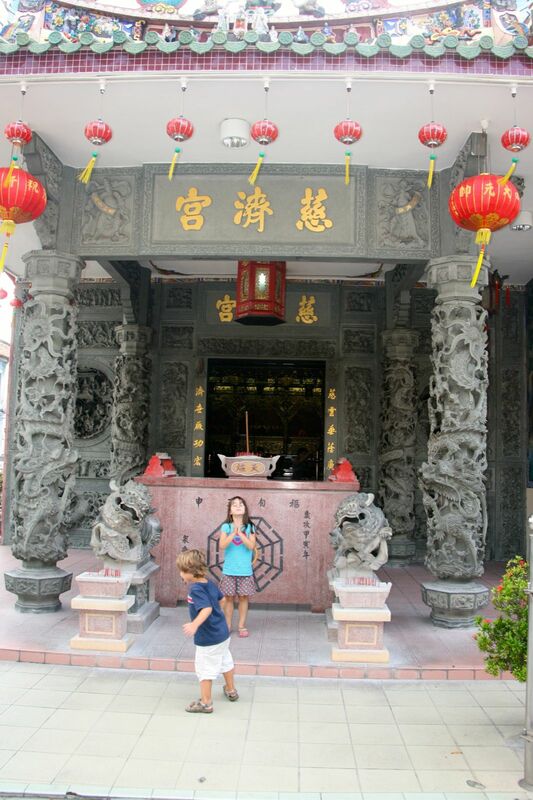 There seems to be a thousand blogs on Penang and how wonderful it is. Two blogs that especially helped us decide on Penang was Bohemian Travelers and Travel With Bender. Both were living in Penang at the time. They both were able to answer so many of my travel questions. They made the transition to living in Penang seamless! It was amazing to arrive and finally meet them in person. We are still making this up as we go. We know we will be in Southeast Asia until next July. Then we will most likely head to South America and live with Uncle Dave. Just kidding Uncle Dave! So far we really love this new lifestyle and hope we can continue this for several more years. Just so long as everyone is still happy! You guys are amazing! I am so happy that you are able to live out your dream with the babies. That takes a lot of guts. I hope I get to see you one day when you are back in the states! Love ya! Tina, we miss you! Thanks! I hope you come visit us where ever we are in this world. We would have so much fun! I love reading about how you managed all this. Smart consumers indeed!!! And I loved how you would mention living with Uncle Dave. love it!! Keeks, tell Uncle Dave to get on our blog so he can see we wrote about him. Ha! He needs to start a blog to keep us all up to date on his travels. goodness stacie. what an experience. we just moved from dalla to houston. elena is having a hard time adjusting. so i just read her your blog to show how different and life changing a move really can be. your kids will have lifelong memories! Nancy, Wow! Congrats on moving to Houston! Quite the weather change from Dallas. Our kids have good days and not so good days too. They miss Texas and their friends, but what has helped us the most is meeting new friends where ever we go. As long as they have kids to play with they seem to do ok. I hope Elena meets lots of new friends quickly. She's a sweet girl so I know she will have no problem meeting friends!! That is such an exciting change for you! Is that guy eating curry fish head? So glad you all found this path! It seems to suit you so well and we are so happy to have met you all. See you someplace in the world soon! We are friends with all those peeps you mentioned, as well as the Kings who told us about you! Welcome to the world of crazy families traveling the globe! We will be in Thailand until late March (any chance you're headed this way?) and then headed to Bali (which you will have left by then...boo hoo!). Hope we run into you some day...somewhere along the road! Thank you! Yes, we plan to be in Chang Mai the first half of Feb, then maybe Bangkok the second half, but not set in stone. Where in Thailand are you? Maybe we can meet somewhere for a playdate?